The Ohio rental agreements, under Chapter 5321 (Titled: Landlords and Tenants), let an owner/agent/manager of property to be able to allow a lessee to occupy property in return for the payment of rent. All terms and conditions must be agreed upon by both parties and upon the security deposit (if any), first month’s rent, and the signing of the contract the tenant shall be allowed onto the premises. All provisions of the lease must be held by landlord and tenant or else violating party will be considered in default. Rental Application – For the primary use of the landlord to ensure that the tenant is employed and their references recommend them. Commercial Lease Agreement – Contract written for the use of business-related space such as office, retail (store, restaurant, etc. ), and/or industrial. Lease with Option to Purchase Agreement – A residential fixed term document with an added benefit to the tenant of being able to buy the property at a specific price. 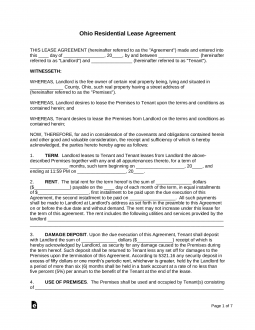 Month to Month Lease Agreement (§ 5321.17)- With no end date, the landlord and tenant may have an ongoing arrangement where payment is made every month. Either party may terminate the contract with at least thirty (30) days’ written notice. Room Rental (Roommate) Agreement – Created for individuals sharing a home where each person shall occupy a bedroom and share the main or common areas. The form shall state the roles of each person and the amount which they have to pay for utilities, expenses, etc. Standard Residential Lease Agreement – Fixed term that usually lasts for twelve (12) months but may be for any specific time-frame as agreed upon by lessor and lessee. Sublease Agreement – Between the lessee and a person that would like to continue the lease between the lessee and the landlord, known as the “sub-lessee”. The sub-lessee must adhere to all the terms and conditions in the master agreement and the lessee shall bear any and all responsibility for their actions in the case of default. Termination Lease Letter – Cancels a month-to-month arrangement with at least thirty (30) days’ notice to either landlord or tenant. Lead-Based Paint – Federally law that requires all landlords/managers/agents to inform any tenant of the possible existence of this type of paint only if the residence was built prior to 1978. According to § 5321.04 landlord may only enter the tenant’s premises at reasonable times and with at least twenty-four (24) hours notice. Interest-Bearing Account (§ 5321.16) – If the landlord accepts either fifty dollars ($50) or the equivalent to one-month’s rent, whichever is greater, it should be held in a interest bearing account at a rate of five percent (5%) per annum if the tenant is to stay on the premises for at least six (6) months. This interest rate must be paid by the bank or landlord. Maximum – There is no State cap. Returning (§ 5321.16) – Within thirty (30) days after the termination of a lease shall the landlord be required to pay back the tenant, along with any interest, their amount for the security deposit.